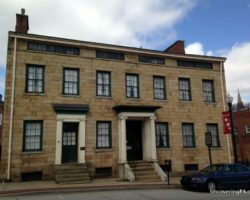 Pittsburgh is home to many fabulous museums, many of which I’ve had the pleasure of visiting. However, if you’re traveling with children, there may not be a better museum in the city than the Children’s Museum of Pittsburgh. 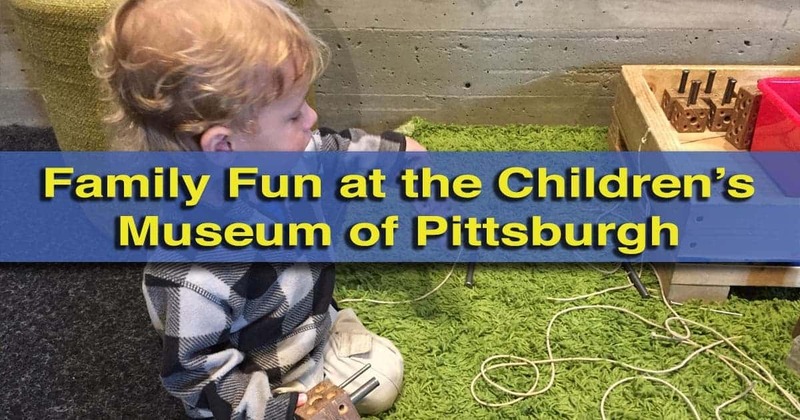 Located on the city’s North Shore, near great destinations such as Randyland, the National Aviary, and PNC Park, the Children’s Museum of Pittsburgh offers children of nearly any age a chance to play, explore, and learn about the world around them. The Children’s Museum of Pittsburgh opened to the public in 1983 in the old Allegheny Post Office. After the planetarium next door moved to the Carnegie Science Center, the museum expanded into that building as well, with a large glass building connecting the two. Today, the museum is home to three levels of exhibits spread between seven different rooms. Each space offers something different for children and most areas have displays to interest a variety of ages. Kids of all ages can have fun at the many exhibits. The first floor of the museum is home to the MAKESHOP, the Attic, the Garage, the Studio, and temporary exhibition space. It is also where visitors enter the museum and the location of the rather tasty cafeteria. The MAKESHOP offers children a chance to make a variety of items using many of the same tools and materials that artists and builders use. Depending on the day, visitors can try their hand at woodworking, circuitry, sewing, art, and much more. A visit to the MAKESHOP allows children and their families a chance to play and design something new during their time at the museum. The Attic and the Garage contain many exhibits that allow children to play while learning about scientific concepts. The rooms feature a variety of slides, balls, and toy vehicles that both roll and fly around the room. 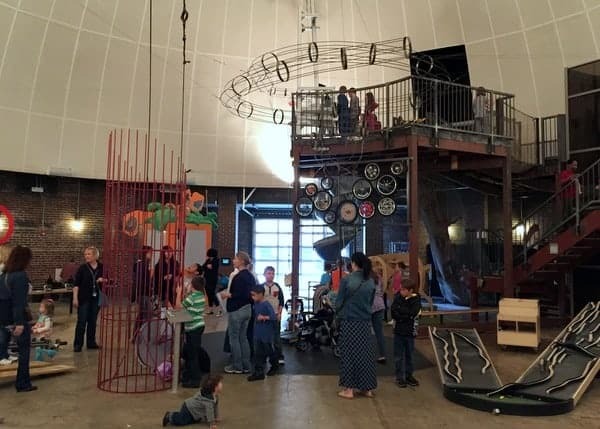 The Garage is the museum’s largest space and features a giant play area for children to climb on, a hand-operated pulley that operates a “roller coaster for balls,” a car building station, and much more. From watching the children at the museum, it was obvious that this is one of the museum’s most popular rooms, and there were many activities that were fun for adults as well. The Garage at the Children’s Museum of Pittsburgh. The museum’s first floor is also home to the Studio, which offers art space for children and the museum’s gift shop. The art space features child-sized easels, clay-shaping tools, and a screen printing area. The Studio also provides access to the Backyard. This outdoor space has a small playground and offers several seasonal exhibits for kids. The second floor of the museum is known as the Nursery and offers play spaces and activities for younger children. In many ways, this reminded me of a church nursery, only with much nicer activities. Here, younger children can do everything from playing with wooden trains to riding a seesaw while playing with kids their own age. 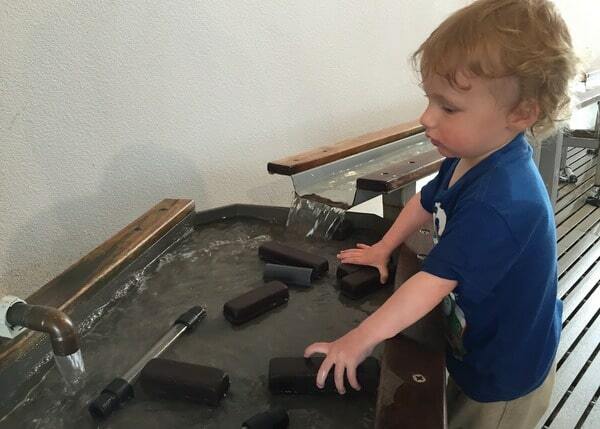 The third floor of the Children’s Museum of Pittsburgh is home to Waterplay. In this space, children can play with water in a variety of different ways. The room is basically one big water playground, so expect kids to get very wet. The museum does offer smocks, but they likely won’t do much once kids start splashing in the water play areas. A change of clothes, either for while playing or for after, is definitely recommended. My son having a good time in Waterplay. I was very impressed with the Children’s Museum of Pittsburgh. As my son was not quite two when we visited, I’m still a bit new to visiting this type of museum. 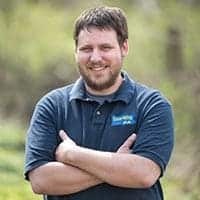 However, given that the Children’s Museum of Pittsburgh is consistently ranked as one of the best children’s museums in the country, I feel confident in its quality. Plus, all of the kids that were there really enjoyed it. At just under two, my son was a bit young for many of the activities at the museum. However, there were still enough things to entertain him, and he especially enjoyed the second-floor nursery and Waterplay. While admission is charged for adults, children under two are free, and I feel like there were enough things to keep him occupied to make our visit worthwhile. In addition to some of the activities, which are just as much fun for adults as they are for children, adults will also enjoy the display cases in the museum that are filled with items from Mister Roger’s Neighborhood. The show was filmed in Pittsburgh and many of the items from the show, including clothes and puppets, are on display inside the Children’s Museum of Pittsburgh. 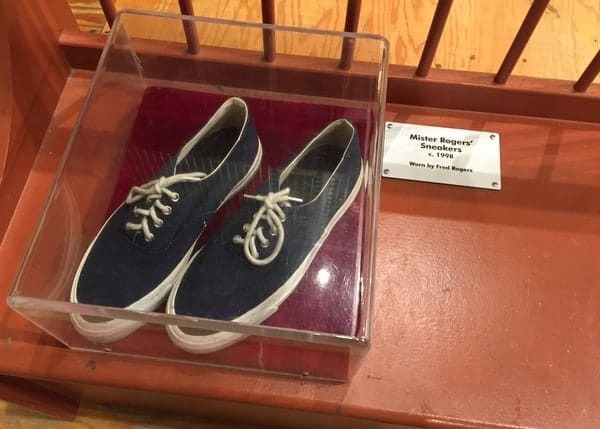 Mr Rogers’ shoes are just some of the items on display at the museum from his show. 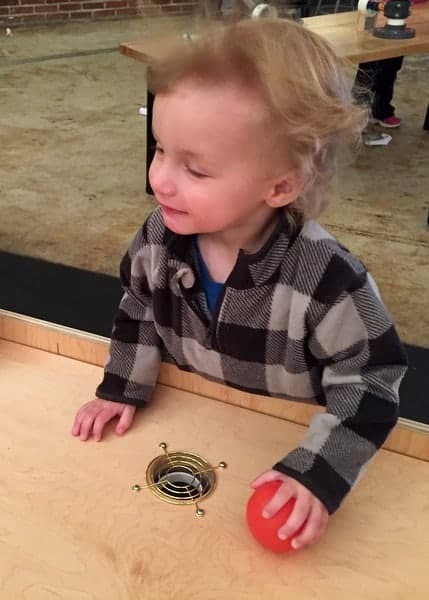 It should also be noted that the Children’s Museum of Pittsburgh goes above and beyond to accommodate children with disabilities. In addition to being completely handicapped-accessible, the museum offers a variety of tools to assist children with autism. This includes having Sensory Friendly Afternoons from time to time. 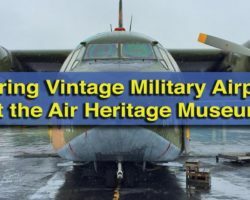 They have also put together a video that shows what the museum is like. This video is also great for adults who want to see if the museum is a good fit for their family. Overall, I was very impressed by the Children’s Museum of Pittsburgh. 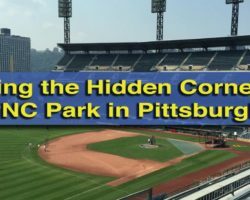 If you are looking for something to do with kids in Pittsburgh, there are few better destinations. Note: My visit to the Children’s Museum of Pittsburgh was hosted by the museum. 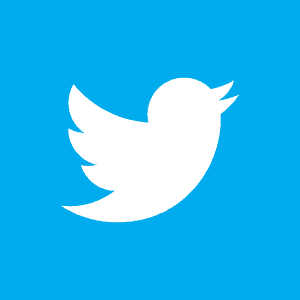 However, the opinions expressed are my own. 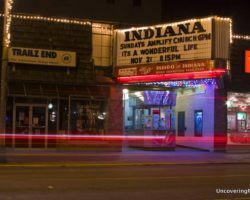 Looking for more great destinations for kids in PA? 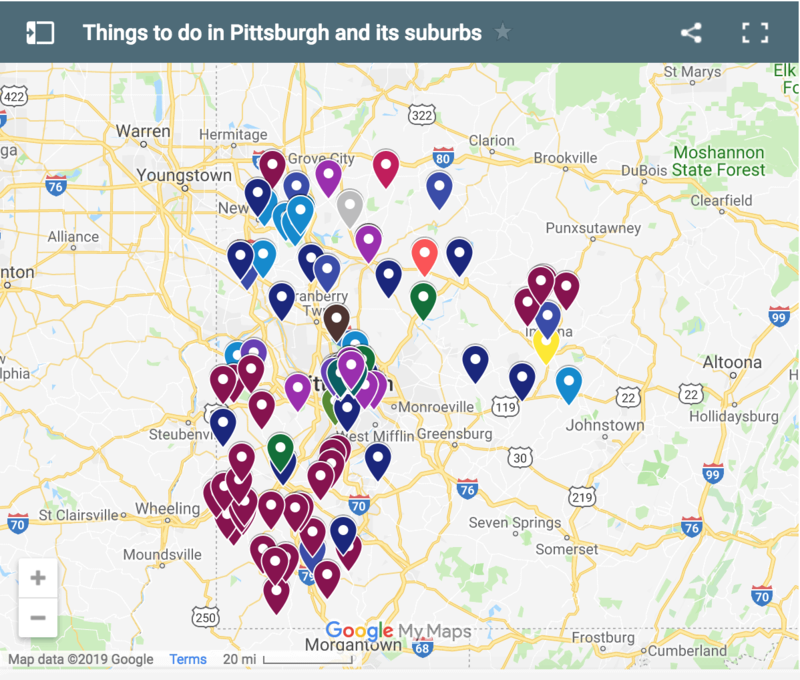 Check out the Please Touch Museum and Smith Memorial Playground in Philly and the Crayola Experience in the Lehigh Valley.